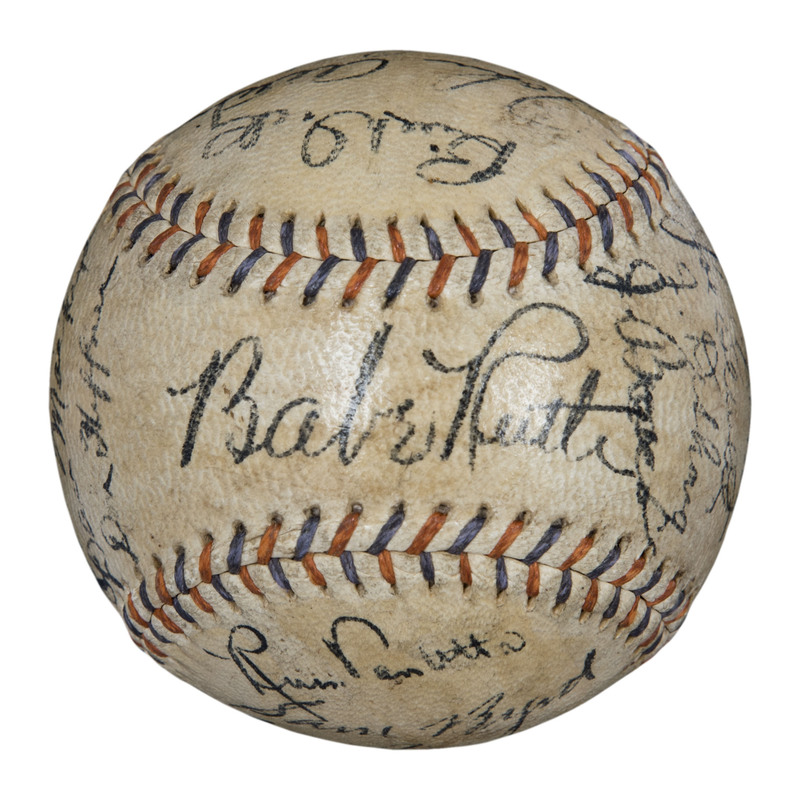 The 1934 season was a pivotal one for the New York Yankees as it marked the last season in which Babe Ruth would wear the famed pinstripes. Under the management of Joe McCarthy, who was entering his fourth season as manager, the Yankees would battle for the pennant against the mighty Detroit Tigers. Behind the awesome combination of Babe Ruth, Lou Gehrig and Tony Lazzeri representing the old guard and young Turks Ben Chapman, Lefty Gomez and Frank Crosetti. This volatile mix of old and young won 94 games, finishing in second place behind the 101-win pennant-winning Tigers. 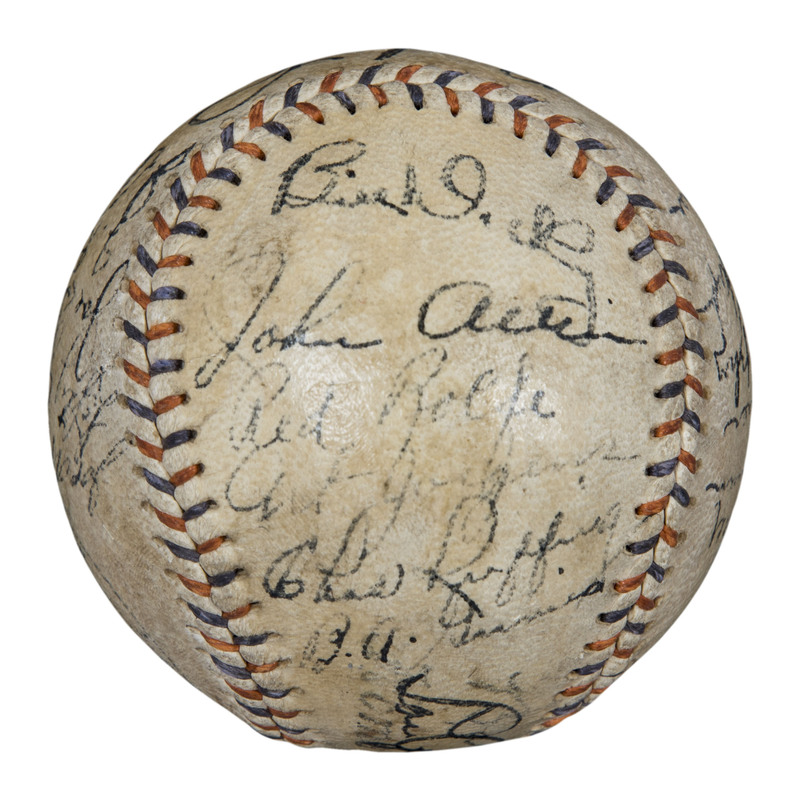 As would one expect to have on a 1934 New York Yankees team-signed baseball, this offered sphere has plenty of star-power represented, including six Hall of Famers and 25 total signatures. The biggest star of them all, Babe Ruth, penned his distinctive and desirable signature across the sweet spot in bold black pen, with Lou Gehrig signing his classy signature on the opposite sweet spot panel – a rarity for Gehrig to sign on the sweet spot, especially with Ruth on the ball at the same time. The other Hall of Famers include Bill Dickey, Burleigh Grimes, Earle Combs and Red Ruffing. 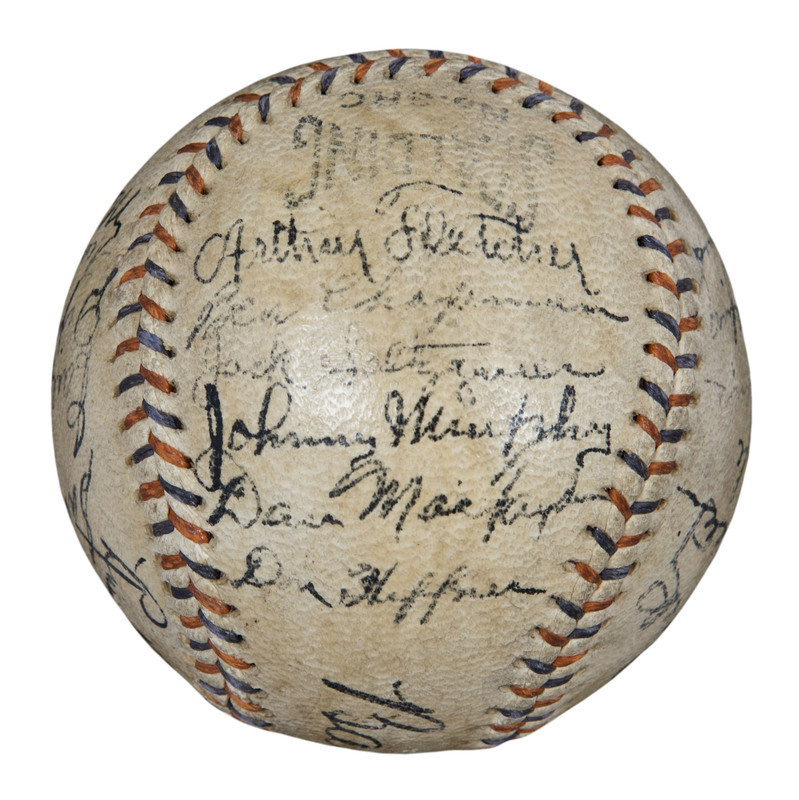 The west panel has the signatures of Arthur Fletcher (clubhouse), Ben Chapman, Jack Saltzgaver, Johnny Murphy, Dan MacFayden and Don Heffner. The north panel has the signatures of Dickey, Johnny Allen, Red Rolfe, Art Jorgens, Ruffing (signed “Chas. Ruffing”) and Grimes. The south panel has the signatures of Russ Van Atta, Sam Byrd, Combs, Dixie Walker, Frank Crosetti and Myril Hoag. The east panel has the signatures of Joe McCarthy (clubhouse), Lefty Gomez (clubhouse), Joe Sewell, Jimmie DeShong and Jumbo Brown. 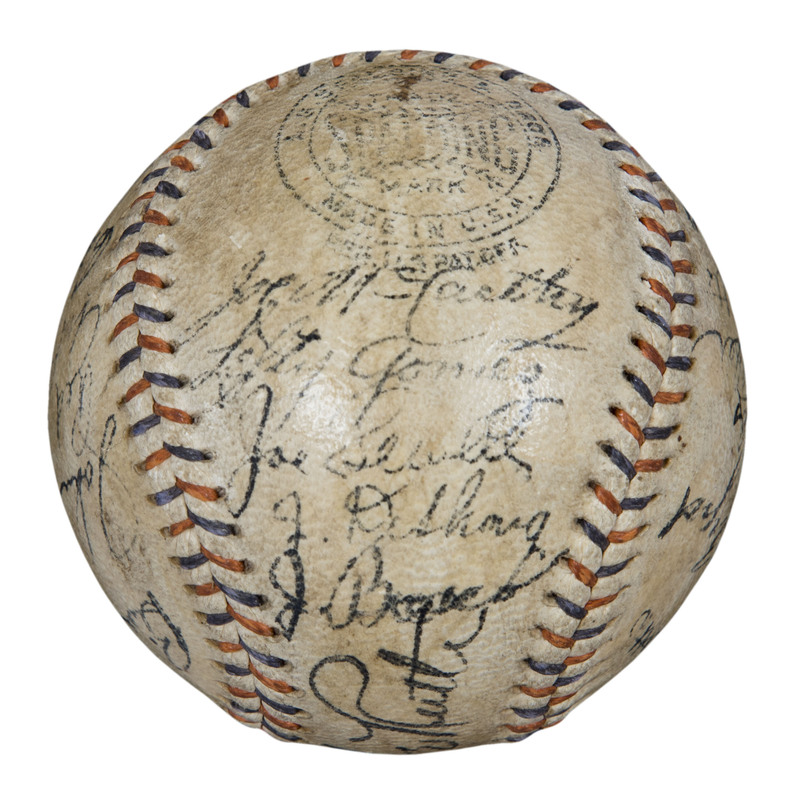 The baseball displays only moderate toning given its age and the signatures have all been signed in black pen and are very strong. A truly remarkable collectible from the end of the Babe Ruth era in Yankees history. 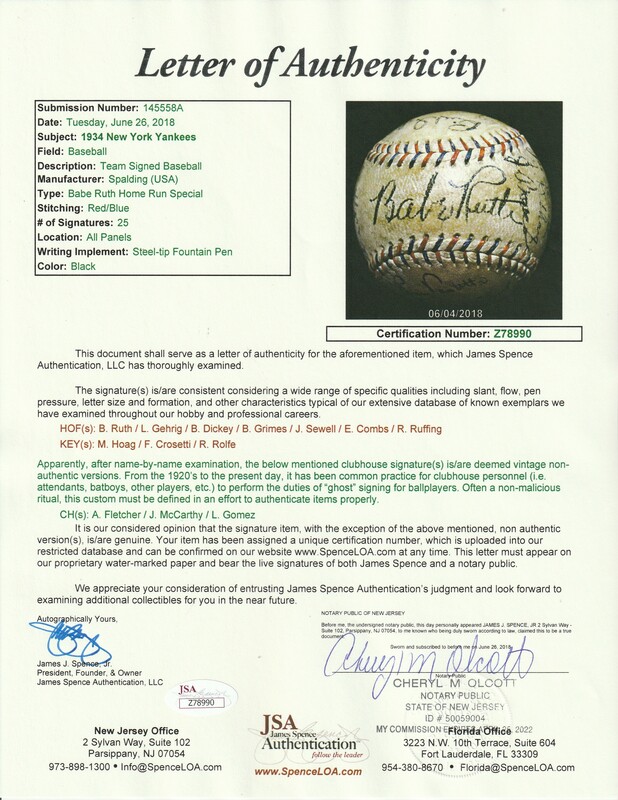 This baseball comes with a LOA from JSA (Z78990). 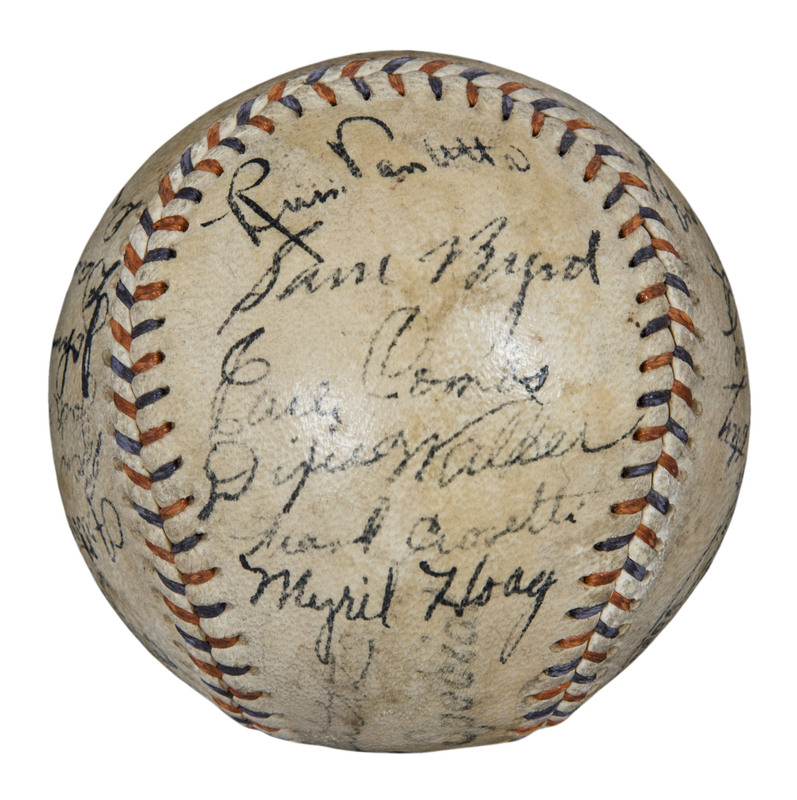 Please note that the catalog title and description listed this baseball as a 1932 New York Yankees baseball. 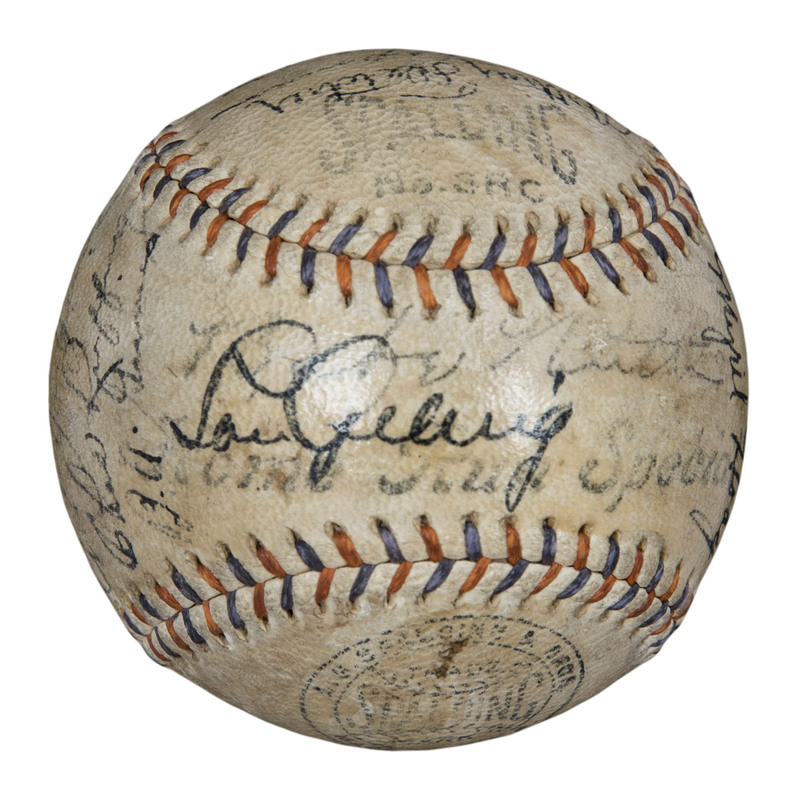 JSA has since changed their evaluation and determined that this baseball was from the 1934 New York Yankees.